17 th & 18 th OCTOBER. this is another blog post, that has been a few days in the making. 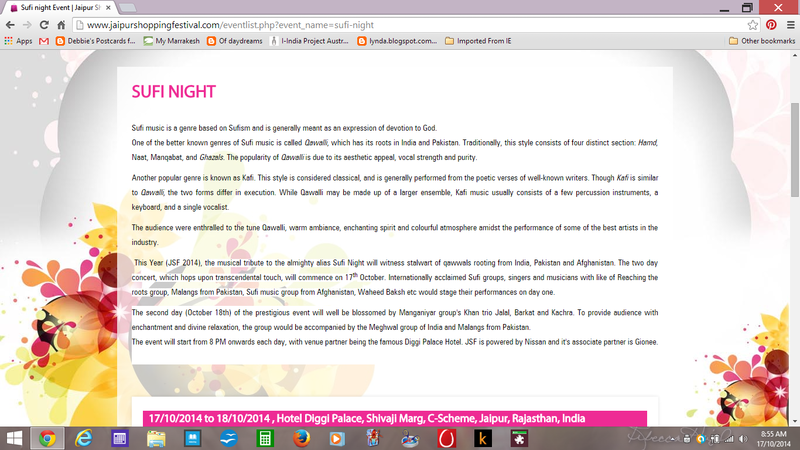 SUFI FESTIVAL is an annual event here in jaipur @ DIGGI PALACE. DIGGI PALACE is where the JAIPUR LITERATURE FESTIVAL will be held next year. SUFI is the MYSTICAL side of ISLAM. beautiful music, singing in UDU (ancient language ), dancing. i must admit, it is an acquired sound. it is very foreign to our ears, but after time, it is so special. over the years, i have a lovely collection of SUFI MUSIC. this is a SCREEN SHOT from my computer. but it gives you an explanation of SUFI music. singers & musicans from RAJASTHAN. this man is from PAKISTAN. he danced, sang and played this instrument. he had such expressive eyes. close up, of his beads. this young boy, must have been about 11 years old. he was singing with the group. the man on the left, he had wooden clackers, in his hands. couldn't he create a beat !! from, SHAH HUSSAIN'S DARGAH IN LAHORE, PAKISTAN. the commentator, said they practise, every thursday evening, & practise this for the love. i took a 14 mn movie. i had seen them, last year @ this SUFI FESTIVAL, and knew what to expect. the man with the DRUM, kept the strong beat going. it was one of those sounds, that goes through you. then the men, started to walk in circles, stomp, stomp. they have bells on their ankles. then they stopped still and started to move their heads, swinging their heads really. some men, shook their heads from side to side. all the time, their long, black, oiled hair, was swinging around and around. I TELL YOU ALL, IT WAS A SIGHT. i think i want a pair. another group of singers & musicians. on the both nights, that i attended, i got what i think was a great seat. 4 rows from the front, on the inside aisle. the media, was a little annoying, but they got put in their place very quickly. and that place was, as low to the ground as possible. if you have never listened to SUFI MUSIC, i encourage you to experience this new sound. well ! a VERY OLD SOUND really. your local library may have cd's that can be borrowed.